The global hybrid and full electric marine propulsion market bears a fairly fragmented vendor landscape, says Transparency Market Research (TMR) in a recently published report. This is solely because of the existence of large, medium, and small scale players in the market. BAE Systems, Wartsilla Corporation, AB Volvo Penta, Niigata Power Systems, and Fairbanks Morse Engine are the leading companies in the global hybrid and full electric marine propulsion market. In this highly fragmented market, larger companies are trying to adopt some strategic alliances to gain better growth opportunities. These players are following vast regulations and requirements for ensuring reliability and safety of their products. Medium-sized vendors in the global hybrid and full electric marine propulsion market are looking out for opportunities to collaborate with larger players for improving their revenue indexes. Established companies are investing more in adopting marine propulsion technology, specifically renewable/hybrid technology for impelling their growth meter in the market. The competition is further getting intensified with the entry of numerous local players who are focusing hard on delivering quality services. 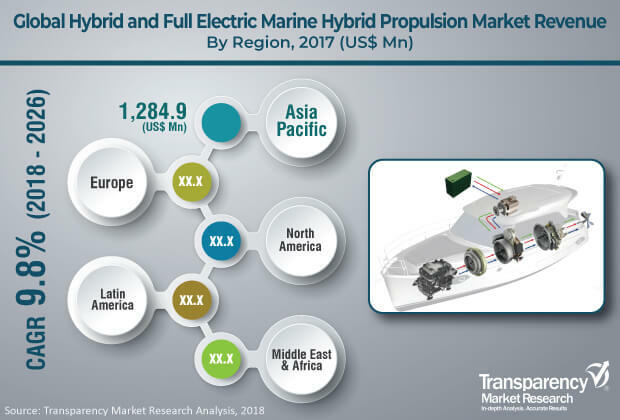 According to experts from TMR, the global hybrid and full electric marine propulsion market is expected to gain revenue worth US$7,516.7 mn by the end of 2026. The market stood at US$3,247.4 mn in 2017. Experts project this growth to occur at a promising CAGR of 9.8% during the forecast period from 2018 to 2026. Among the various propulsion types in the market, demand for hybrid vessel segment is expected to boost the global hybrid and full electric marine propulsion market during the forecast period. This is because of high utilization of solar and renewable energy as storage option in hybrid vessels. Region wise, Europe is expected to account for a dominant share in the global hybrid and full electric marine propulsion market in the coming years. This is attributed to the increasing promotion about the development of carbon-free fuel efficient marine systems in the region. Marine propulsion is a system or mechanism which is employed for generating thrust to move boat or ship across water. In hybrid and full electric marine propulsion systems, mostly battery packs are used for the propulsion. The minor difference between these two types of propulsions include the source of power for generating the propulsion. In full electric marine vessels, complete propulsion is made by the usage of rechargeable batteries. On the other hand, in hybrid marine vessels, alternate fuel such as LNG and Diesel as well as battery are utilized to make the propulsion. Such USPs are driving the global hybrid and full electric marine propulsion market. Along with this, governments’ stringent regulations in pertaining carbon emissions along with oil spillage are augmenting demand in the global hybrid and full electric marine propulsion market. Furthermore, increasing number of marine ships for various operations and rising usage of ferries in coastal waterways are also boosting the global hybrid and full electric marine propulsion market. Apart from these, rapid incorporation of advanced technologies in marine propulsion systems is also fueling growth in the global hybrid and full electric marine propulsion market. A few major challenges hindering the growth of the global hybrid and full electric marine propulsion market include the volatile prices of crude oil and governments’ strict rules against marine fuel emissions. Nonetheless, the sluggish growth rate of the market is compensated by persistent demand for low-priced LNG and natural gas for making the propulsion in hybrid vessels. Such factors are believed to help overcome this challenge in the near future. The review is based on a market research report by TMR, titled, “Hybrid and Full Electric Marine Propulsion Market (Propulsion Type - Hybrid Vessel, Full Electric Vessel; Vessel - Tugboats and OSVs, Ferries, Defense Vessels, Yachts, Cruise Ships; Power Rating - Up to 1 MW, 1.1-2 MW, 2.1-3.5 MW, Above 3.5 MW; RPM - 0-1,000 RPM, 1,001-2,500 RPM, Above 2,500 RPM) - Global Industry Analysis, Size, Share, Growth, Trends, and Forecast 2018 - 2026”.